I’m reminded of the Donovan song, “Atlantis,” where at the end he emotes a haunting wail, “Hail, Atlantis!” ERB evokes this same kind of mystical past history in his creation of the ancient oceans of Barsoom, especially Throxeus, mightiest of the five oceans that once rolled upon the surface of the red planet millions of years ago. What follows will entail the history of he ancient oceans and their main cities, one occupied by Red Martians, two by the fair-haired, white-skinned ancient race most Martians believe are extinct, the others dead cities inhabited by the Green Hordes and the Great White Apes. The ancient race – which observant readers of the Tarzan saga will immediately recognize as associated with the Atlantean gold colony of Opar – that sailed the mighty five oceans, comprised the Golden Age of Martian history, as were the days of Atlantis on Earth. “I opened my eyes upon a strange and weird landscape. I knew that I was on Mars; not once did I question either my sanity or my wakefulness. I was not asleeep, no need for pinching here; my inner consciousness told me as plainly that I was upon Mars as your conscious mind tells you that you are upon Earth. You do not question the fact; neither did I. “I found myself lying prone upon a bed of yellowish, moss-like vegetation which stretched around me in all directions for interminable miles. I seemed to be lying in a deep, circular basin, along the outer verge of which I could distinguish the irregularities of low hills. “We had gone perhaps ten miles when the ground began to rise very rapidly. We were, as I was later to learn, nearing the edge of one of Mars’ long-dead seas, in the bottom of which my encounter with the Martians had taken place. “In a short time we gained the foot of the moutains, and after traversing a narrow gorge came to an open valley, at the far extremity of which was a low table land upon which I beheld an enormous city. Toward this we galloped, entering it by what appeared to be a ruined roadway leading out from the city, but only to the edge of the table land, where it ended abruptly in a flight of broad steps. “As we neared the plaza and my presence was discovered we were immediately surrounded by hundreds of the creatures who seemed anxious to pluck me from my seat behind my guard. A word from the leader of the party stilled their clamor, and we proceeded at a trot across the plaza to the entrance of as magnificent an edifice as mortal eye has rested upon. “The building was low, but covered an enormous area. It was constructed of gleaming white marble inlaid with gold and brilliant stones which sparkled and scintillated in the sunlight. The main entrance was some hundred feet in width and projected from the building proper to form a huge canopy above the entrance hall. There was no stairway, but a gentle incline to the first floor of the building opened into an enormous chamber encircled by galleries. “On the floor of this chamber, which was dotted with highly carved wooden desks and chairs, were assembled about forty or fifty male Martians around the steps of a rostrum. On the platform proper squatted an enormous warrior heavily loaded with metal ornaments, gay-colored feathers and beautifully wrought leather trappings ingeniously set with precious stones. From his shoulders depended a short cape of white fur line with brilliant scarlet silk. Slowly, Carter learns more about the city in which he is strangely imprisoned. A young Martian female, Sola, is ordered to watch over him and he resides in her room. “My fair companion was about eight feet tall, having just arrived at maturity, but not yet to her full height. She was of a light olive-green color, with a smooth, glossy hide. Her name, as I afterward learned, was Sola, and she belonged to the retinue of Tars Tarkas. She conducted me to a spacious chamber in one of the buildings fronting on the plaza, and which, from the litter of silks and furs upon the floor, I took to be the sleeping quarters of several of the natives. Dejah Thoris is soon captured and after Carter rescues her from the assault of a Green Martian, they explore some more mosaics together. “Dejah Thoris and I then fell to examining the architecture and decorations of the beautiful chambers of the building we were occupying. She told me that these people had presumably flourished over a hundred thousand years before. They were the early progenitiors of her race, but had mixed with the other great race of early Martians, who were very dark, almost black, and also with the reddish yellow race which had flourished at the same time. “These three great divisions of the higher Martians had been forced into a mighty alliance as the drying up of the Martian seas had compelled them to seek the comparatively few and always diminishing fertile areas, and to defend themselves, under new conditions of life, against the wild hordes of green men. “Ages of close relationship and intermarrying had resulted in the race of red men, of which Dejah Thoris was a fair and beautiful daughter. During the ages of hardships and incessant warring between their own various races, as well as with the green men, and before they had fitted themselves to the changed conditions, much of the high civilization and many of the arts of the fair-haired Martians had become lost; but the red race of today has reached a point where it feels that it has made up in new discoveries and in a more practical civilization for all that lies irretrievably buried with the ancient Barsoomians, beneath the countless intervening ages. “These ancient Martians had been a highly cultivated and literary race, but during the vicissitutes of those trying centuries of readjustment to new conditions, not only did their advancement and production cease entirely, but practically all their archives, records, and literature were lost. “Dejah Thoris related many interesting facts and legends concerning this lost race of noble and kingly people. She said that the city in which we were camping was supposed to be have been a center of commerce and culture known as Korad. It had been built upon a beautiful, natural harbor, landlocked by magnificent hills. The little valley on the west front of the city, she explained, was all that remained of harbor, while the pass through the hills to the old sea bottom had been the channel through which the shipping passed up the city’s gates. “Left alone, I ascended the winding corridor to the upper floors in search of suitable quarters. The beauties of the other buildings were repeated in this, and, as usual, I was soon lost in a tour of investigation and discovery. I finally chose a a front room on the third floor, because this brought me nearer to Dejah Thoris, whose apartment was on the second floor of the adjoining building, and it flashed upon me that I could rig up some means of communication whereby she might signal me in case she needed either my services or my protection. “Adjoining my sleeping apartment were baths, dressing rooms, and other sleeping and living apartments, in all some ten rooms on this floor. The windows of the back rooms overlooked an enormous court, which formed the center of the square made by the buildings which face the four contiguous streets, and which was now given over to the quartering of the various animals belonging to the warriors occupying the adjoining buildings. “While the court was entirely overgrown with the yellow, moss-like vegetation which blankets practically the entire surface of Mars, yet numerous fountains, statuary, benches, and pergola-like contraptions bore witness to the beauty which the court must have presented in bygone times, when graced by the fair-haired, laughing people whom stern and unalterable cosmic laws had driven not only from their homes, but from all except the vague legends of their descendants. “My plan of action was formed upon the instant, and crossing the square and the bordering avenue upon the opposite side I soon stood within the courtyard of Tal Hajus. “The brilliantly lighted apartments of the first floor told me where first to seek, and advancing to the windows I peered within. I soon discovered that my approach was not to be the easy thing I had hoped, for the rear rooms bordering the court were filled with warriors and women. I then glanced up at the stories above, discovering that the third was apparently unlighted, and so decided to make my entrance to the building from that point. It was the work of but a moment for me to reach the windows above, and soon I had drawn myself within the sheletering shadows of the unlighted third floor. “We finally came upon my thoats in the courtyard where I had left them, and, placing the trappings upon them we hastened through the building to the avenue beyond. Mounting, Sola upon one beast, and Dejah Thoris behind me upon the other, we rode from the city of Thark through the hills to the south. They are ambused by a Warhoon patrol and Carter stands them off to give Dejah Thoris and Sola a chance to escape. The Warhoons are a rival horde of the Tharks and have, like the Tharks, taken their name from the name of the ancient city. Carter makes a gallant stand but is eventually overwhelmed and taken captive to Warhoon. “Kantos Kan had been detailed to one of the small one-man fliers and had had the misfortune to be discovered by the Warhoons while exploring their city. The bravery and daring of the man won my greatest respect and admiration. Alone he had landed at the city’s boundary and on foot had penetrated to the buildings surrounding the plaza. For two days and nights he had explored their quarters and dungeons in search of his beloved princess only to fall into the hands of a party of Warhoons as he was about to leave, after assuring himself that Dejah Thoris was not a captive there. “During the period of our incarceration Kantos Kan and I became well acquainted, and formed a warm personal friendship. A few days only elapsed, however, before we were dragged forth from our dungeon for the great games. We were conducted early one morning to an enormous amphitheater, which instead of having been built upon the surface of the ground was excavated below the surface. It had partially filled with debris so that how large it had originally been was difficult to say. In its present condition it held the entire twenty thousand Warhoons of the assembled hordes. There is some very exciting fighting in the arena before Kantos Kan and Carter agree to fake Carter’s death, leaving Kantos Kan as the last man standing and the victor allowed to have his freedom. Night falls, the arena empties, and Carter climbs out of the arena and escapes to safety. After a sojourn at the atmosphere factory and as an air scout for the Zodangan navy, Carter flies to Helium to see what he can do to save Dejah Thoris from marrying the son of the Jeddak of Zodanga, who has declared war upon Helium, but is willing to settle for peace if the Dejah Thoris consents to marry his son, which she does, believing Carter is dead. Carter comes across a great battle between the Tharks and Warhoons and, shoulder-toshoulder with Tars Tarkas, they beat off the Warhoons. 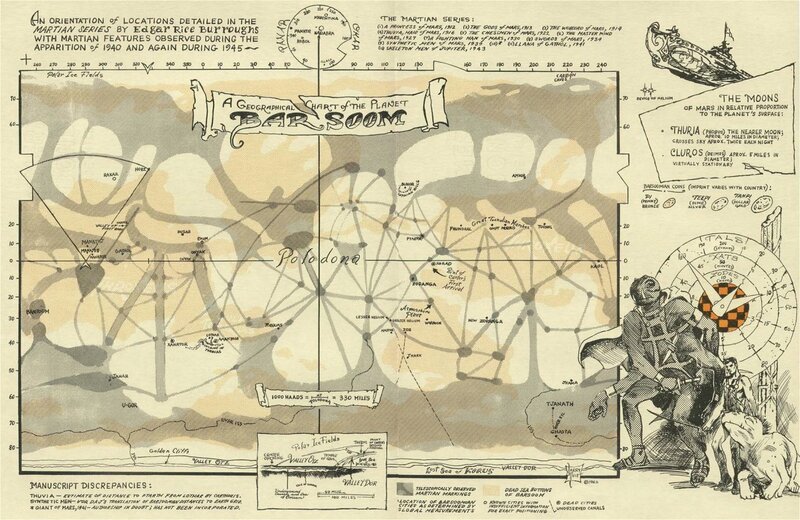 Carter unites the green hordes and leads them to sack Zodanga and then on to Helium where the combined forces of Helium and the green men defeat Zodanga and crush the once rival of Helium to the status of a third world nation on Barsoom. This differs from his description in Princess where Zodanga is a thousand miles to the southwest of Helium. This has led some cartographers to put a “New Zodanga” on their maps, which I believe they have done in error. (See, ERBzine #2807.) It is like the magic Christians use to explain away the myriad contradictions in the Bible in the hopes of keeping their delusion in tack that it is the inerrant word of God without contradiction. ERB may be the true creator god of Barsoom, but he was far from inerrant. The fact is that he made a mistake. 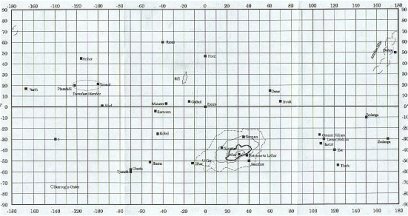 The maps mostly accurately depict the location of Korad, Thark, Warhoon, the atmosphere factory, and Zodanga, in the same proximity. 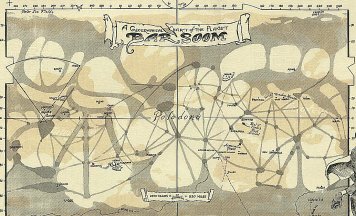 Since Carter started out in one dead sea bottom and crossed two more with the green horde, we can deduce that three of the five ancient oceans of Barsoom were in this area, none of them even approximating the size of the mighty Throxeus, which we will begin to survey in Part Two. 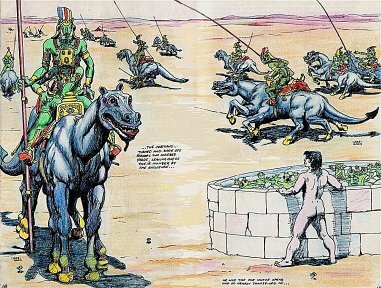 Runner-Up in the Seven Wonders of Barsoom!